I was looking for GeoExt's tree example for my project, and I found official tutorials are kind of hard to understand for the GeoExt beginners. 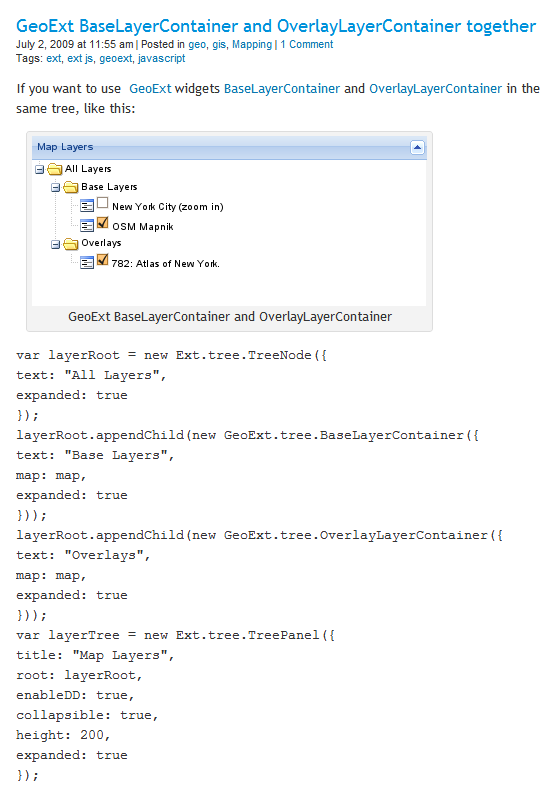 On Googleing through the internet, I found nice and easy way of creating tree structure menu using GeoExt BaseLayer and Overlay layer tree. 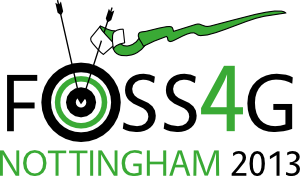 Free and Open Source Software for Geospatial North America is calling for Student Volunteers to encourage student participation at FOSS4G-NA Conference 2013 at Marriott City Center, Minneapolis, MN May 22–24, 2013. Apply by April 1, 2013 to select on random drawing. As a volunteer, students will be able to participate in all of the conference activities such as staffing the registration desk or being a room monitor for a session. You will get a complimentary registration to the conference, but you will still need to get yourself to Minneapolis and find lodging. Applicants need to be a currently registered, full-time student at a college or university in North America. Volunteers may be asked to confirm their student status.To ensure volunteer opportunities are spread across institutions, only one person from each college or university will be selected until all institutions are represented by one student. For institutions with multiple campuses, each campus will be allowed one student. OpenGeo is going to sponsor FedGeo Day 2013 at Washington DC on Feb 28, 2013. The theme of the conference is about Modern Tools for GIS, Geo Data & Cartography, which will introduce you to GIS, cartography, web mapping, and map publishing tools, show you what you can do with them, and walk through how and why government agencies are using them to dramatically improve their mapping, cartography, and GIS projects. OpenGeo is proud to support FedGeo Day, the exciting new conference in Washington DC. The event offers a platform for those who work in or with federal agencies to share their experiences with modern open source geospatial technologies. We’re looking forward to seeing case studies of how these tools are being used in government, what benefits they bring, and why so many agencies are shifting to open source technology. There will also be interactive demos that explore specific open source tools and applications. The schedule is packed with programming that should be particularly attractive for those for those who make technology decisions within the federal government. pyKML is an open source Python library for generating, parsing, and modifying KML, the geo-spatial data language used by Google Earth, Google Maps and a number of other GIS platforms. pyKML helps working with large and complex KML documents by leveraging the use of basic programming constructs (looping, branching, etc.). In this regard pyKML is similar to libkml, Google’s open source C++ library, but takes advantage of the highly readable syntax of the Python programming language and the processing capabilities of the popular lxml Python library.